The strawberry tree (arbutus unedo), also known as arbutus, is a shrub in the family of Ericaceae. Native of the Mediterranean region, is highly widespread in Sardinia (Italy). 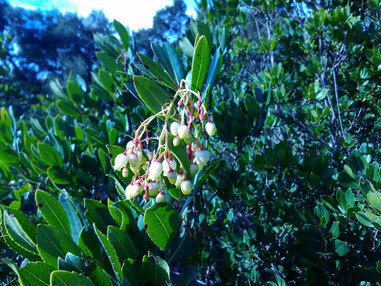 The arbutus has evergreen leaves and its fruits are red berries with a distinctive flavor, often used to make tasty jams and spirits. The flowering takes place in autumn, between October and November, and the white-yellow flowers are a great resource for honeybees, that use their nectar to make a top quality honey. Sardinia is the Italian region with the highest production of arbutus honey. This is due to the important presence of strawberry tree in the island, but also to the warm weather, that allows the bees to forage the nectar even in late autumn. Because of the unpredictable weather conditions, the production of this type of honey varies a lot from one year to another, and this contributes to make it a very rare and thus valuable honey. 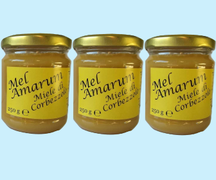 This honey has an intense aroma, very bitter, and is therefore often called bitter honey (“miele amaro” in italian). Its special flavour reminds of the licorice root, the gentian spirit and the rhubarb. It leaves a constant sour/astringent taste in the mouth. The fragrance is very distinctive as well, is pungent and bitter. It reminds of the smell of the ivy leaves, coffee grounds or burned leather. The unique flavour and smell, as well as the rarity and the therapeutic properties, make the arbutus honey one of the most expensive honeys, but also one of the most loved by honey lovers and connoisseurs all around the world. A peculiarity of the arbutus honey is its rapid crystallization, compared to other honey varieties. 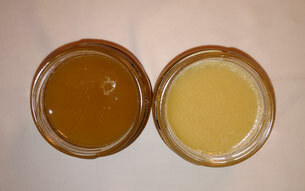 In the picture you can see two arbutus honey jars, in the left one the honey is liquid, while in the right one is crystallized. 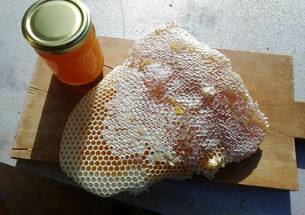 In fact, this process modifies both the consistency and the colour of the honey. 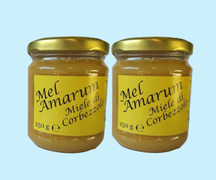 When this honey is liquid it has a dark amber colour, while when it crystallizes, the colour becomes hazelnut/brown with grey- green shades, and the honey gets a soft creamy consistency. Often, the crystallization does not take place uniformly, but can firstly regard only the top or the bottom of the jar. Therefore, when you notice clearer areas, you should not think they are flaws, but a typical and natural honey process. The arbutus honey has a large number of therapeutic properties. It is very effective in the treatment of the flu, especially in the suppression of the cough. It is also of a great help in asthmatics states and, in general, for respiratory diseases. 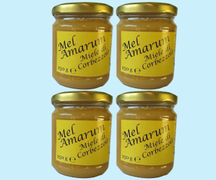 The high concentration of glucose and the acidic PH provide this honey with a strong antibacterial effect. It has anti inflammatory and cleansing properties, is a great antiseptic of the urinary tract, and also has diuretic and anti-diarrhea properties. 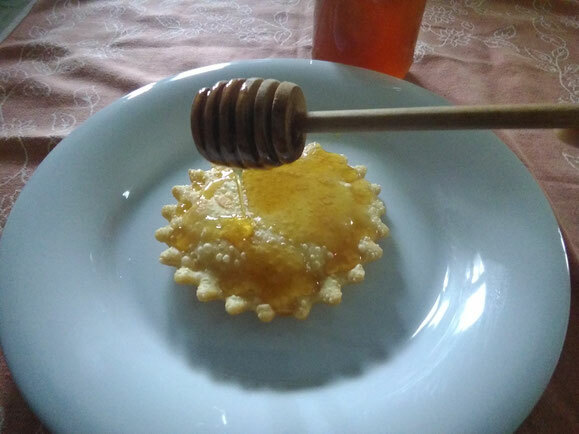 In the Sardinian tradition, it has for long been used to facilitate sleep: eating a teaspoon of this honey before going to bed will help you to rest better. 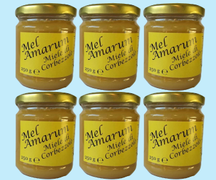 Arbutus honey is great with fresh cheese, ricotta, pecorino cheese (Italian sheep cheese), but also with walnuts and the Sardinian carasau bread. It is often used in desserts such as ice cream and sebadas (a Sardinian dessert, in the picture on the left). Last but not least, arbutus honey is used to make alcoholic drinks such as honey brandy (acquavite al miele), a typical grappa of Sardinia. Analysis made by CREA (Italian Research Council for agriculture and agrarian economy analysis). What are you waiting for? 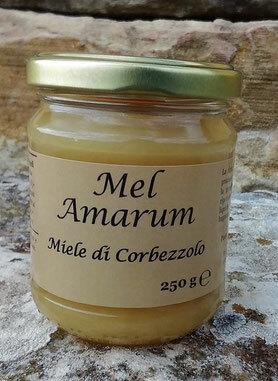 Try Mel Amarum now!